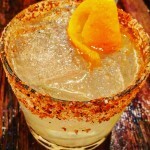 Have you ever tasted warm spiced beer? 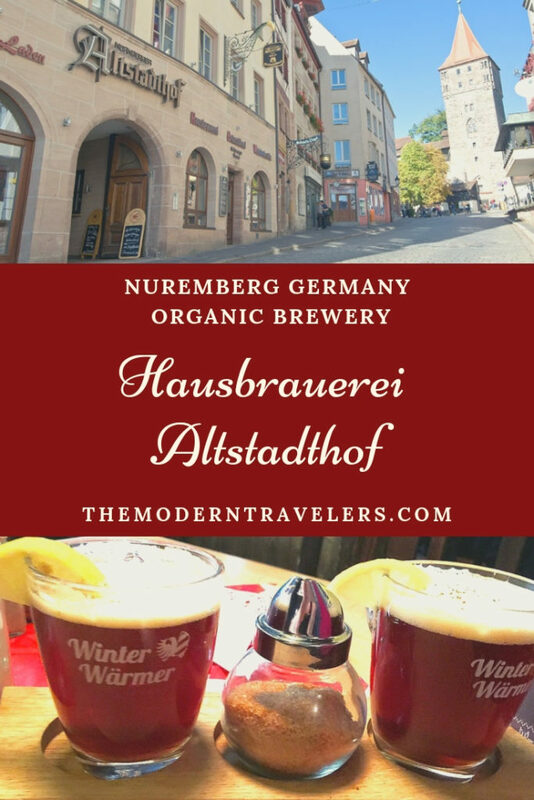 If not, you are in for a treat at the Nuremberg organic brewery, Hausbrauerei Altstadthof. 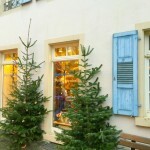 This is the first certified organic brewery in Germany. 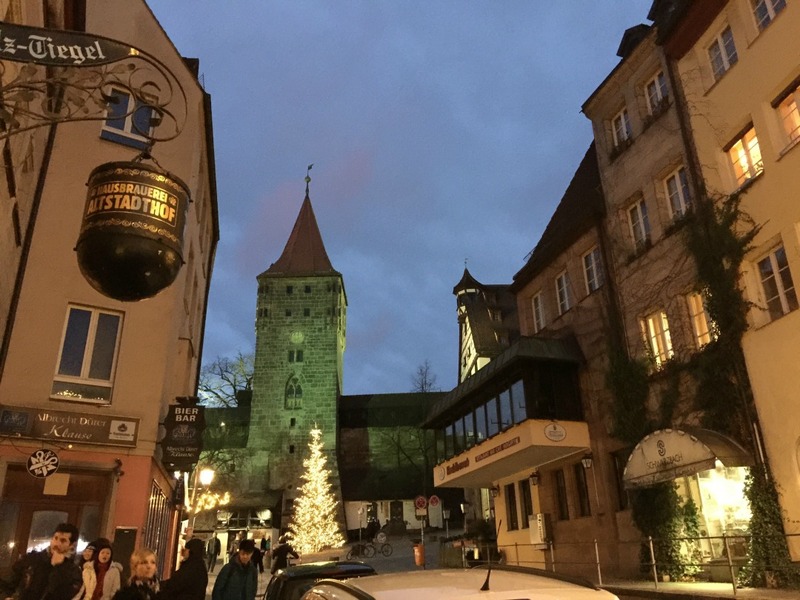 Founded in 1984, Hausbrauerei Altstadthof is committed to preserving Nuremberg’s original beer recipes by using the finest locally farmed organic ingredients. This way, the beer retains its regional integrity. 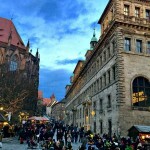 Beer has a foothold in Nuremberg’s history and heart. Until the 17th century, everyone drank it, including children. It was safer than water. Below the streets of Old Town are sandstone tunnels and chambers where beer was stored. They’re called “Rock-Cut Cellars.” In the 1800’s, when refrigeration became available, they stopped using the tunnels. During WWII, the tunnels were used as air raid shelters and a way to save artwork and valuables from destruction. 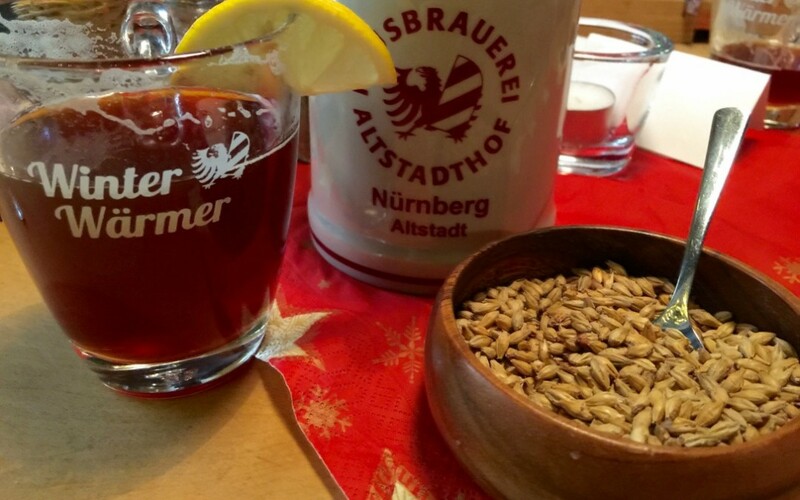 Hausbrauerei Altstadthof is famous for upholding Franconian beer traditions and for their exclusive malty red beer. I tried it and it was smooth, delicious, and glowed reddish-amber in the glass. 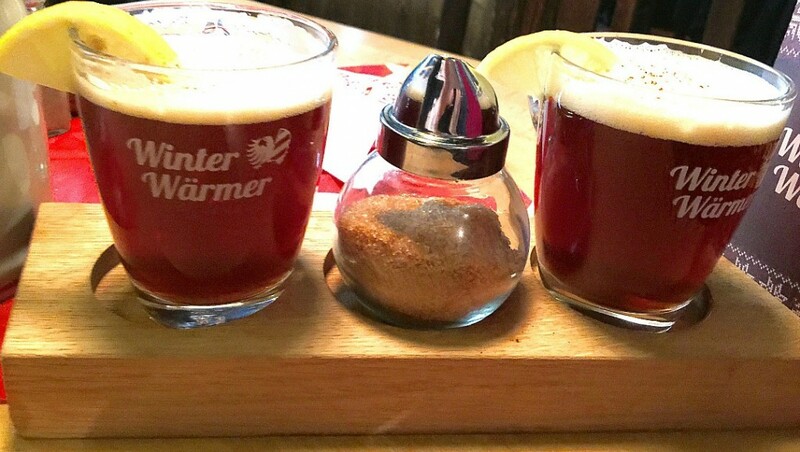 For me, the thrill was the Winter Warmer, a hot, fragrant beer that tastes like the beer version of mulled wine. I’ve never tasted warm spiced beer and I’m really picky about my beer. There aren’t a ton of beers that I care for. I’m a Weisbier girl. And sometimes an interesting ale here and there. But warm spiced beer? Yep. It’s good! Really good. At the Christmas markets I love to enjoy the smell of gluhwien and Feuerzangenbowle, but it’s too strong for me, so I don’t drink it. This Winter Warmer? I could drink a couple of these, it’s delicious without being too strong. I wish it would catch on and become more available. 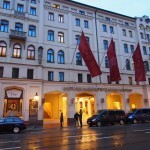 They serve classic German fare and there is a Vegetarian section on the menu. I had potato soup and salad. I loved that I was eating organic food sourced as locally as possible. 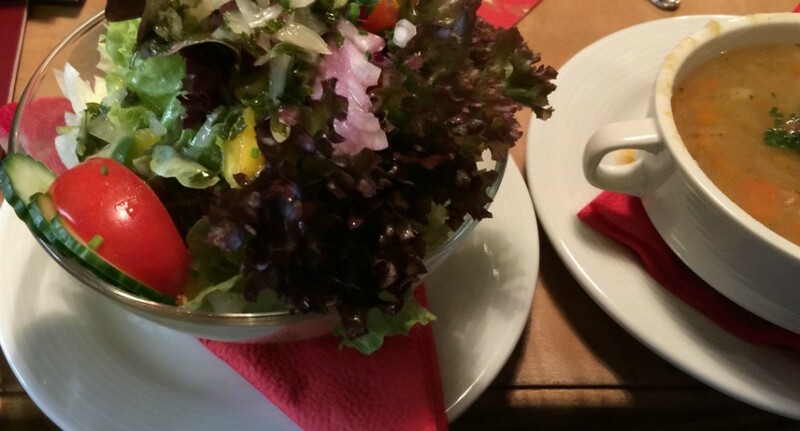 Any time I have access to healthy food like this while traveling, I am grateful. It went well with the beer, which, by the way, is also said to have some health benefits. If you like dark wood and copper, you’ll like this atmosphere. It has a pretty classic pub ambiance. Comfortable, casual and rustic. Hausbrauerei Altstadthof is wonderful. 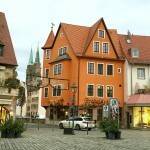 If you go to Nuremberg and like beer, this place is a must. 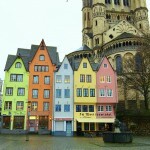 It’s located in a charming part of town, near Albrecht Dürer’s home. 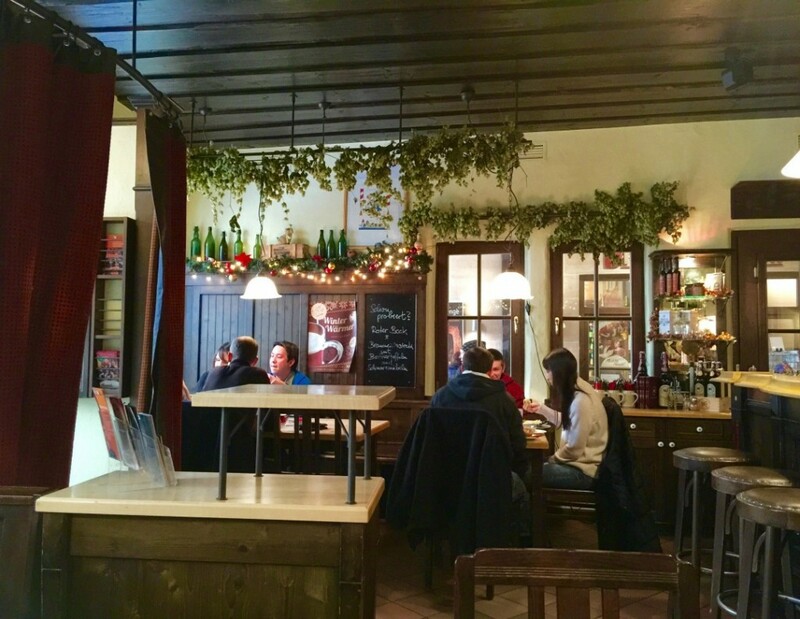 It’s also below the castle and makes a perfect place to have lunch or drinks after touring the Kaiserburg. Find out more on the brewery website.